Here at NOTY, it’s axiomatic that a truly great name has it going both ways. Just look at the Hall of Name: Assumption Bulltron, Nimrod Weiselfish, Tanqueray Beavers, Princess Nocandy, Vanilla Dong, Destiny Frankenstein. And we haven’t inducted a new class in a while, so no Barkevious Mingo, Taco B.M. Monster, Nohjay Nimpson or last year’s winner, Kobe Buffalomeat. First name and last, front and back, top and bottom. These great names bring it every which way. Your 2018 Name of the Year does too. 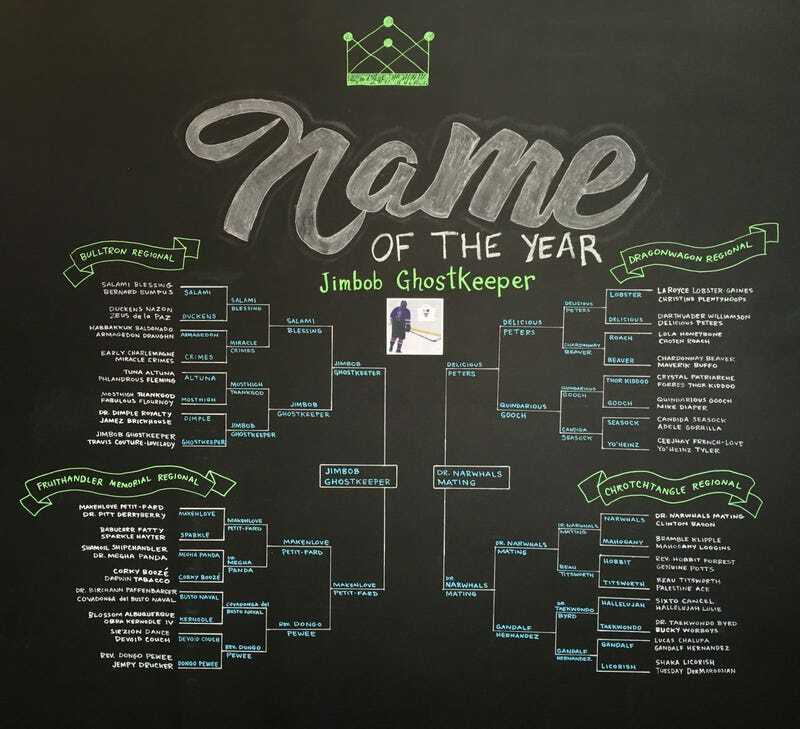 With surprising ease, Canadian hockey player Jimbob Ghostkeeper waffleboarded away Dr. Narwhals Mating in the championship final, racking up a whopping 57 percent of the more than 7,500 votes cast. “There’s a few stories going around,” Shane Ghostkeeper says. “One anthropologist lady where we grew up said it refers to the fact that there are medicine men in my family. It’s been a long line, and it keeps getting passed down, and it has to do with having knowledge of ceremonies that are used to conduct communications with the other entities that exist among us, the spirits. Cool etymology either way. But Jimbob? What’s Jimbob doing there? Plenty. First, kudos for the closed compound, bucking the traditional two-word construction. Second, there’s a complementary dissonance between “Jimbob” and Ghostkeeper” that makes the name pop, and it also scans nicely when spoken. Finally, while the first name screams Southern, you can find it in Canada, where Bob’s your uncle and Jim Bob might be too. Thanks to everyone who voted. Visit our website, follow us on Twitter and send us your nominees for 2019. Until next year, good night, Jimbob. Stefan Fatsis is the author of Word Freak and A Few Seconds of Panic, and a cohost of Slate’s sports podcast Hang Up and Listen.